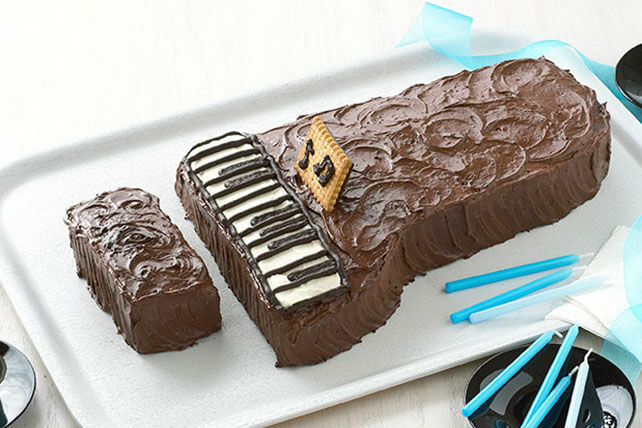 Let this grand cake make a musical statement at any music lover's birthday. Beat dry pudding mix, sugar and milk with whisk 2 min. Stir in 1 cup Cool Whip; use to frost piano and bench pieces. Spread remaining Cool Whip into 12x8-inch rectangle on piano as shown in photo. Melt chocolate as directed on package; pour into resealable plastic bag. Cut small piece off one bottom corner of bag; use to draw piano keys on Cool Whip. Use any remaining chocolate to draw small music notes on cookie; place on cake for sheet music. Refrigerate 30 min. or until glaze is firm. Keep cake refrigerated. For an ivory piano, prepare using a white cake mix and Jell-O Vanilla Instant Pudding. Enjoy a serving of this rich and indulgent cake on special occasions.